Made from high-quality materials, shoes are soft and comfortable everyday flat shoes. Durable and flexible sole for stable rhythm walking. The pillared outsole has a massage function when walking, which is light and comfortable. Classic and elegant design, smooth lines and comfortable arc, let you be more free to move. Occasion: Suitable for everyday and various leisure activities, such as walking, picnicking, school, driving, traveling, shopping or any occasion you like. We offer a variety of colors to give you a better choice. Note: The number of shoes is too small. It is recommended to choose the big one. These gorgeous pair of flats is an essential addition to every modern woman’s shoe collection! 1. Please refer to our size chart, we recommend you buy a larger size. 2. The simple Style Classic Flats and fashion color design make you more stylelish, and match for any dress. 3. 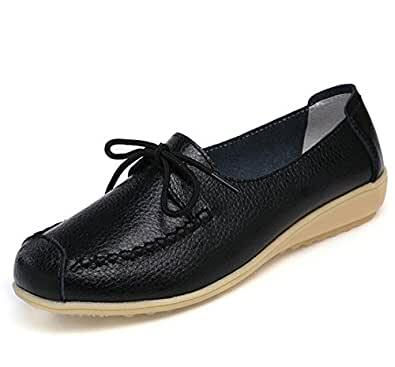 Women Flats are made with high quality soft upper more breathable, and the Bee tendon sole anti- skid. And the shoes are lightweight and easy clean, give you one day relax and comfortable.